How do I print the schedule of a specific department. What are the print options that I can select. You can print your schedule at any time using the "Print" button located on the top left of the screen. Note that you cannot print the schedule of all locations at once. You must do it once per location. Printing the schedule will automatically follow the filters that you have activated in your scheduler. 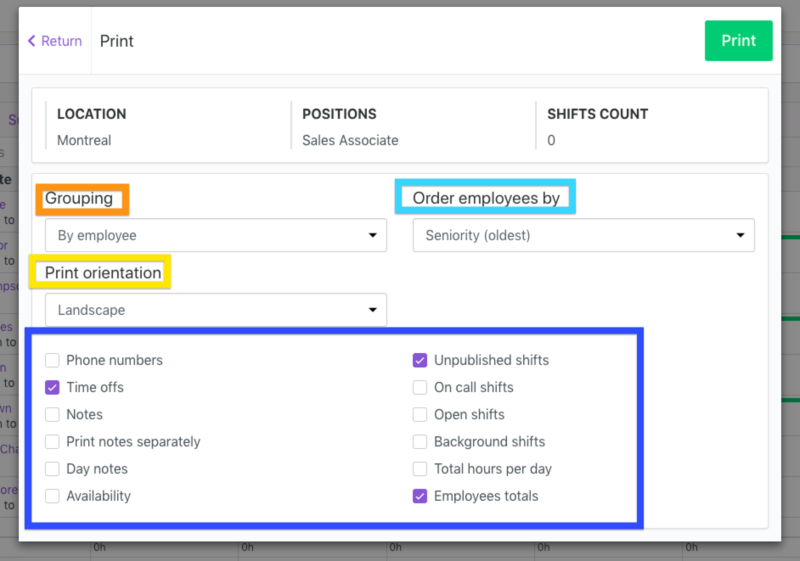 For example, if you singled out the position "Sales associate" in your filters, only that position will be printed. Remove all filters if you want to print the full schedule. A part from using the filters to scope your print, you can activate additional options in the printing window. Most other options are self-explanatory (such as Phone numbers). However, a few deserve additional explanations. Unpublished shifts: All new or modified shifts that you haven't published (still in draft) will print.